Net Folder Servers represent a physical OES or Windows file server. Net Folder Servers are connections to specific volumes (on OES servers) and shares (on Windows servers). You can set up multiple connections to each server as needed. 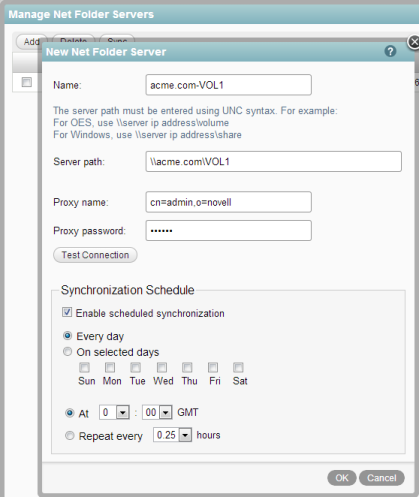 You can set up each Net Folder Server to synchronize on a schedule that you specify. Under Management, click Net Folder Servers. The Manage Net Folder Servers page is displayed. In the Name column, click the LDAP server name that you synchronized during the LDAP synchronization process, then skip to Step 6. (Conditional) If the LDAP synchronization process for importing users does not contain at least one user who has a Home folder associated with them, you need to manually add a new Net Folder Server. Or, you can run the LDAP synchronization, as described in Section 14.1, Synchronizing Users and Groups from an LDAP Directory. To manually add a new Net Folder Server, click Add, then continue with Step 6. This is already populated if the search context of your LDAP sync contains an OES or Windows server. Server path: The path to the OES or Windows server. This is already populated if the LDAP synchronization process for importing users contains at least one user who has a Home folder associated with them. The server path must be entered using UNC syntax. For example, for OES, use \\server_DNS\volume. For Windows, use \\server_DNS\share. You can use DNS or IP address in the Name and Server path fields. DNS must be properly configured on the virtual appliance in order for it to work. Proxy name and password: Specify the fully qualified, comma-delimited name and password for the proxy user used to access the OES or Windows server. IMPORTANT:Before you specify a proxy name and password for the Net Folder server, ensure that you review the information in Section 5.1.2, Planning the Net Folder Server Proxy User. Test connection: Click this button to make sure the path is accurate and that the credentials are valid, then click OK after the test succeeds. Sometimes proxy users with the incorrect context pass this test. Ensure that the context for your proxy user is correct, as described in Expected Name Format for Windows, OES, and NetWare File Servers. Synchronization Schedule: Specify the schedule for when you want the synchronization between the file system server and Filr to occur. This becomes the default schedule for each Net Folder associated with this server. Synchronizations can be scheduled only if you have configured the Net Folder Server to use Full Synchronization as the synchronization method (as described in Section 5.1.4, Planning the Synchronization Method). When setting the synchronization schedule, be aware that the schedule that you choose can greatly affect system performance. Before you set a synchronization schedule, review the information in Section 5.1.5, Planning the Synchronization Schedule. For Home folders to be displayed in the My Files area for each user, ensure that you have completed the steps in Section 4.0, Setting Up Personal Storage. After Net Folder Servers already exist in your Filr system, you can manage them as described in this section. Click the name of the Net Folder Server that you want to modify. Make the desired modifications, then click OK. When you create a Net Folder Server, you can enable a synchronization schedule, as described in Section 5.3.1, Configuring Net Folder Servers. Under Management, click Net Folders. Select the Net Folder Server that you want to manually synchronize, then click Sync. NOTE:Before you can delete a Net Folder Server, you must first delete any Net Folders that are associated with the Net Folder Server. Select the Net Folder Server that you want to delete, then click Delete.